IRCTC (Indian Railway Catering and Tourism Corporation) as popularly known is a branch or subsidiary working under the Indian railways. It specializes in all tourism sector activities. IRCTC provides online ticketing and do catering services to its clients. It gives outstanding services efficient and well organized. The IRCTC as a subsidiary government under the full effect of the ministry of railways works in both the private and public sector. The Indian railways is one of the biggest and busiest transport segment in the world. Many citizens prefer the train than any other means of transport. It’sconvenient, cheap and has no traffic problems. You get to your destination very fast and it has high chance of safety. Here you have the privilege to book train trips and also cancel the trips if something comes up. You can register for IRCTC new account and enjoy the full service of IRCTC. The online booking has come to comfort the citizens of India as long queues are no long forgotten, you get your ticket and are assured that you have reserved your seat. The government is really doing its best to go cashless, and avoid corruption cases and claims of payment. You only need a legal IRCTC ID. It is very cheap and with few press you get your ticket. I-tickets: thisare booked online by the passengers wherever they are. The tickets are then printed and taken to the passenger via courier or mail services. E-tickets: they booked online by the passenger but the tickets will be non- printed and the passenger will do the printing on his/her end. However it is more advisable to have you ticket on your target. Save it on your phone or PCs and laptops. It more convenient and sure you can recover when lost unlike the paper ticket. IRCTC Tatkal eTicket: What is IRCTC Tatkal ticket? This a service offered by the IRCTC online railway service. It applies to passenger who need agent services at travel in as short notice. It a bit had to get for the system allows on four reservation in a day, which is one ticket one train per day. The railways gives chances before the customer make a decisions on taking a Tatkal ticket. This ticket is charged higher than normal and to discourage passengers from booking, they don’t refund the money once the ticket is confirmed. It only on special conditions. This system was introduced in the year 1997 and still on till to-date. You can do the booking manually or through the internet. Its advance period is only 24 hours, they ensure the Tatkal preservation is for all classes. This type of ticket has a lot restriction and can be booked for 8:00 to 12:00. Name of the one doing the service. The travel agency you are using. It is very easiest process ever seen how to join IRCTC New Account or how to create a IRCTC Login Registration just follow the below steps you will Open a IRCTC New Login very easily…..
Click on the “Sign Up” tab, a registration form will pop up fill in your details. It shows the registration form for IRCTC New Account. Note you have to be 15 years and above. Fill details like name, age residence etc. Key in your mobile and e-mail address. You will find a verification button for the number and e-mail address. Terms and condition will be displayed on the page, read and accept. Press submit the registration form. Now you have sing up with the IRCTC. Like airplane flight the trains have their classes too. 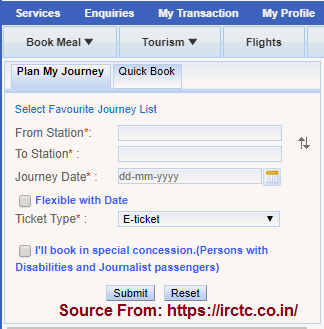 You can choose which you want online through the IRCTC login system. In each class there are different advantages and also comforts. Look at the different classes to book your now. SL: (Sleeper class) Sounds awesome, this class you need to book in advance it more of Tatkal class although you can just book normal. It amount is high than other classes. 1A: (First Class AC) it has nice wooden furnished rooms. It has the feeling of 5-star hotel with all the luxury. 2A:(2-Tier AC) basically like 3star hotel. 3A: (3-Tier AC) it’s like the SL but has the AC services available. CC: (Chair Car) it is a normal arrange train with seats arranged like a bus. There are two of the cc one with AC and one which doesn’t. 2S: (Second Sitting) this one you have to reserve the seat in advance.it is mostly taken for short distances trains. GN: (General) this one you can book the tickets on the same day. It just a normal train anybody can pop in. After opening an account you use this steps to book. You will Find a IRCTC login request tab. 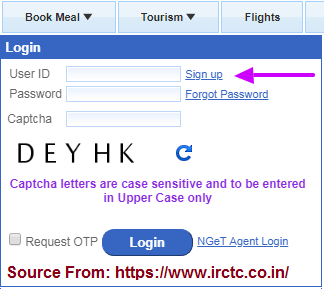 Enter your IRCTC New Account Valid Login details very carefully. Press “OK” and the IRCTC website will bring a page. Now key in the date the journey will start then submit. After the submit button such a page appears. Select your class and the time and submit the details. Click on book now when you get to see the seat available on the train. Recheck all the details and make the proper payment, then make online transaction. Submit the payments and a successful message will be sent to your mobile or email address. Now you’re ready for the journey. What is passenger name record? The IRCTC system has many terminologies and PNR is one of them. It a 10 digit number which is locate on top of your ticket. It is very unique and you can’t find it on any other ticket. It also helps in making claims as the railways company will just refer to the number and sort the matter easily. Cancellation also done using the same PNR record. Time saving: Long before the online booking was introduce the passengers had to make long lines. They wasted a lot of time just to reserve a seat and maybe some wouldn’t succeed. Long queue: Everyone hates standing and just waiting. The new technology has come in handy for the citizens they just seat and make few clicks. Curb corruption: The whole new system helps trace all transaction made. The client has the receipt and also the records are saved in the servers. Comfortable: Before the reservation wasn’t a sure deal you could find some passengers stranded at the railway station. Maybe the train booking never went through thus inconveniencing the person. Now you are sure about your seat and hours to travel. Feedback: The IRCTC system is giving all the required information. You don’t need to ask the tellers at the railway station. Some might give wrong information or not answer at all. The IRCTC has an enquiry place and you get everything done in seconds. Flexible: You can cancel the booking made earlier by using the same online system. You don’t have to visit the station again. It gives you assurance that you don’t have a trip and the money might be refunded either part or full. This is the best new tech everyone needs to go for.